The MVOC accepts clothing donations on a regular basis. All items must be serviceable and in good to excellent condition. No damaged footwear or previously worn undergarments are accepted. All items must be laundered and clean prior to drop-off at the main MVOC building located at 268 Central Street, Gardner, MA. New items are also welcomed. Storage availability is limited, so please call first to make drop-off arrangements. 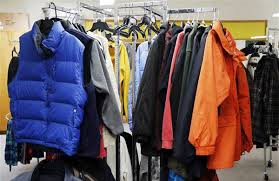 Clothing items are maintained and available primarily for the homeless veteran population and residents in the MVOC housing programs. However, low income veterans who qualify for food support can also access our clothing supplies.